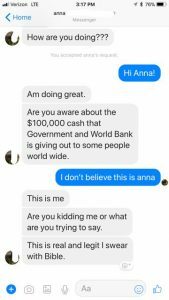 The Better Business Bureau is seeing an increase in reports of scammers reaching victims through Facebook Messenger, and some people locally, including Sisters, have already been approached! You get a Facebook Messenger chat that looks like it comes from a Sister, friend or relative. In some cases, scammers have hacked into your friend’s Facebook account. In other versions, the scammer creates a separate look-alike account by stealing your friend’s photos or their name. Either way, scammers are banking that you will trust a message that appears to come from someone you know. They will then come up with an urgent need for you to send money to them, or let you know about a free government grant that just needs you to pay an application fee. This is an example of a screenshot of a Facebook Messenger scam. As David Sprague in IT says, whenever you are talking to someone, whether online, Facebook, or the phone … one major key to security is knowing for sure WHO you are communicating with. Just because the message says it is from another Sister or just because the person on the phone says they are from Social Security or your doctor’s office, does not guarantee that’s who it really is. 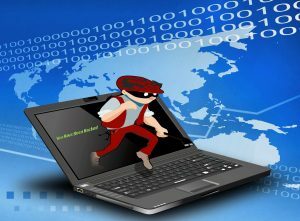 Before you give any confidential information or send money or let someone take control of your computer, be absolutely sure you know who is making the request and why. If there is ANY doubt, terminate the contact and/or get someone else involved immediately. A second opinion from David, Doug Herman, another staff member or Sister, will help you think through the potential risks. Be especially suspicious if someone pressures you to provide information or tells you to act quickly. Legitimate contacts will almost never do that. You might get a message that “so-and-so” wants to connect with you on Messenger. But you are already their friend – so they would not have to message you that way to connect. The name is misspelled, or in lower case. The “person” asks for money and is insistent … or wants you to “friend” their new Facebook account. Your best bet, especially if you are being pressured for money or information, is to break the connection. The IRS, Social Security, your doctor will not be asking you for money on Messenger. If it is someone you think is your friend, give them a call. These scams tend to look alike, give David or Doug a call and they can help you. If the person continues to contact you on your device, the best bet is to completely turn off your device — whether it is a phone, laptop or other computer — until you can contact David Sprague. We will be glad to confirm any information and get you socializing again. Most scams follow similar patterns. Learn more about government grant scams (bbb.org/grantscam), financial scams (bbb.org/investmentscam), and online shopping scams (bbb.org/webpurchasescam) from the Better Business Bureau website. Can scammers get any personal information, like get into your bank account from just writing with you? I have this exact same scamming technique writing to me atm. and i am just writing back to him (I am not gonna give any personal information or click on any link). I am just curious and want to waste his time. I keep getting messenger friends first questthey ask is where are you from? Where do you live? I have just recently seen this from a family/friend of mine. Sha sent me a link to a lady petty emily Georgina. I did what she told me she said I was approved for 75,000 dollars she sent me a little invoice with the info on it. I spoke with my friends brother and he said she told him the same thing but I am still sceptical. How do I find out if this is for real.